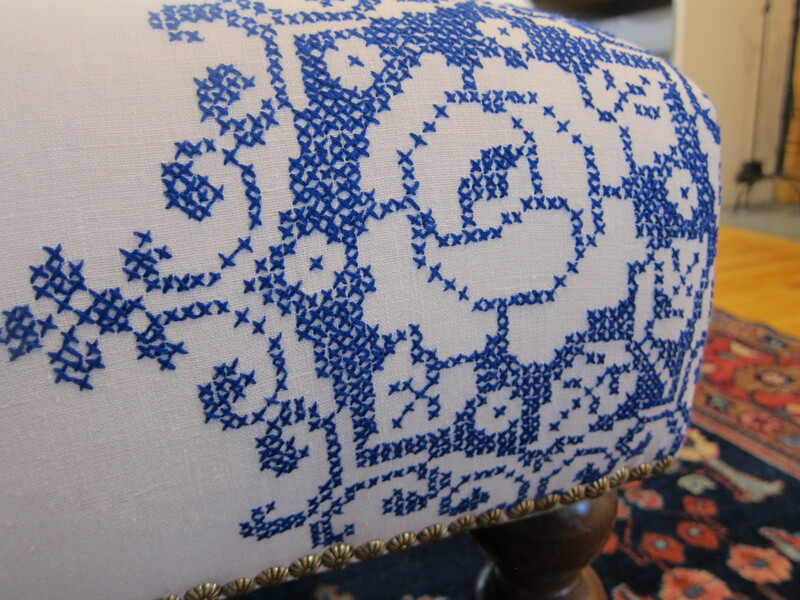 My TV room ottoman has a new life and a bright look thanks to a repurposed vintage tablecloth. 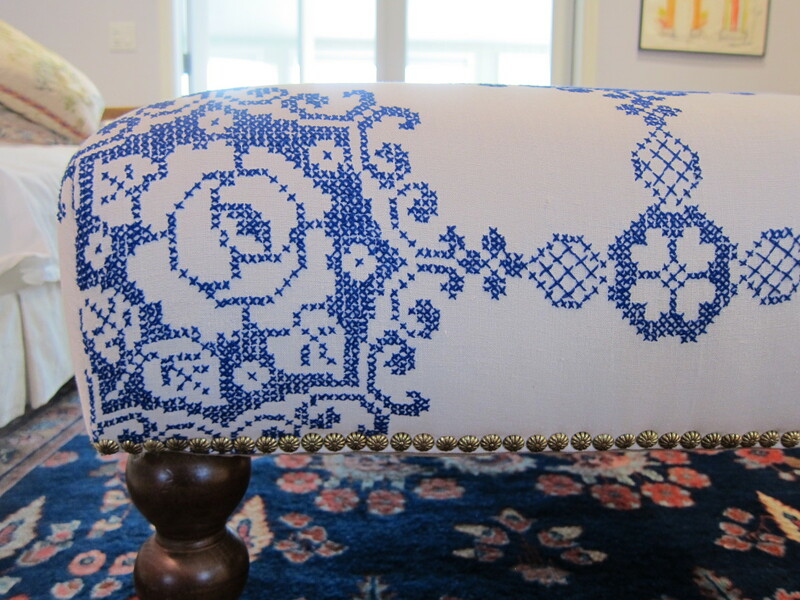 I repurposed a vintage tablecloth — natural linen with royal blue cross stitch embroidery — to recover an ottoman and I love the stunning result. The tablecloth was embroidered by my step-aunt Jeannie and my mom may have passed it along to me. While clearing out things in my basement I discovered it in a plastic storage container where it had languished for four decades — unused and forgotten. I am a dedicated re-purposer even when it comes to upholstery. At 48″ x 26″ the TV room ottoman — similar to this Lee Industries piece — was purchased at Crate and Barrel twelve years ago. It isn’t overly large or wide. But it was heavily used and the original navy linen covering had begun to fray at the corners and no longer matched the new white sofa. 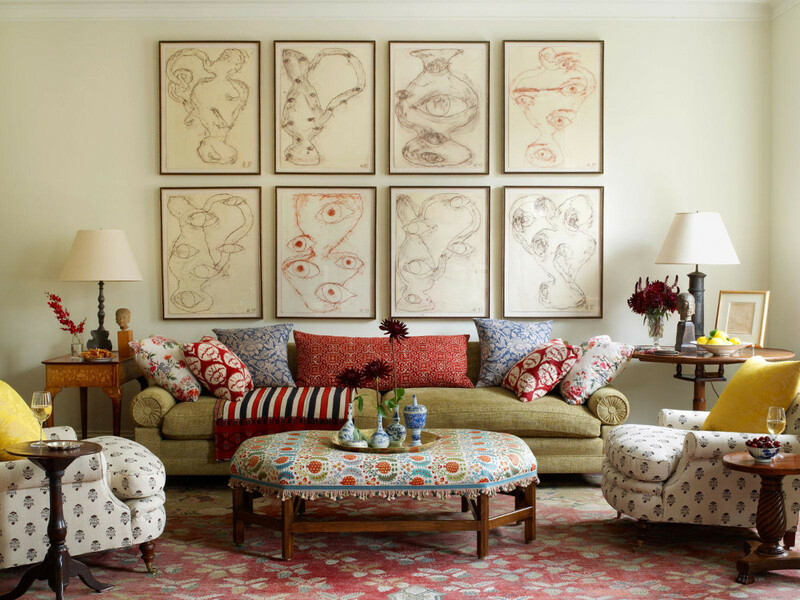 My original intent was to redo the ottoman with for a suzani textile like the one I’d seen in a House Beautiful living room. That would coordinate with my embroidered pillows covers I’d purchased from an EBay seller in Uzbekistan in 2010 and which Allison found and used in her home originally. However, prices for suzani embroideries went crazy as the look became trendy and elegant older pieces were snapped up by dealers. At first I was hesitant about using the vintage tablecloth. The pattern is cabbage roses and a little sweet. 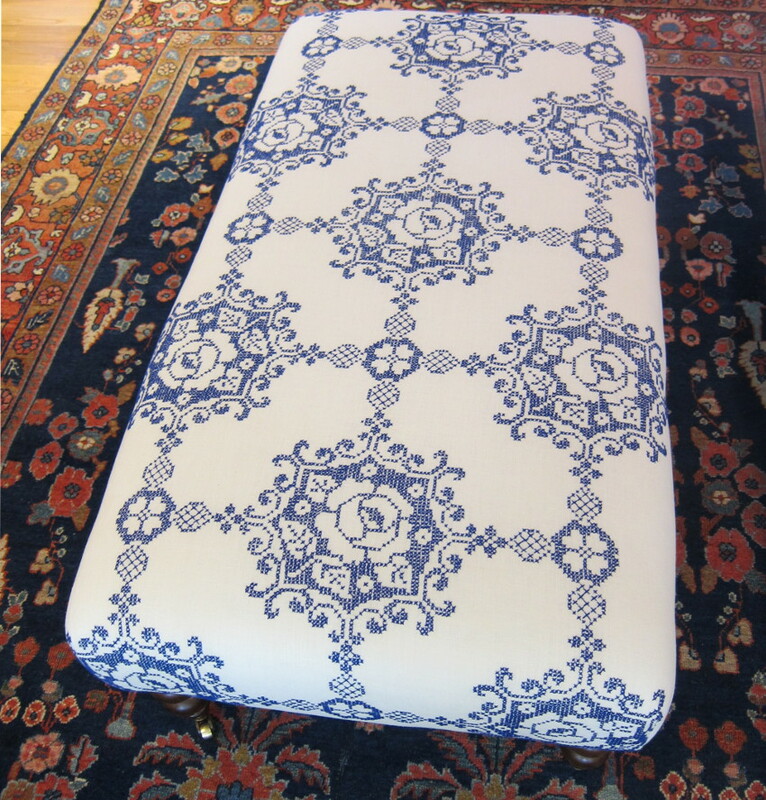 But when I draped it over the ottoman, to see if it was large and wide enough to cover the top as well as the thickness of the sides, it looked great. Best of all, it was free! Plus, if I didn’t use it for the ottoman, it was headed for eBay as a vintage embroidery-kit tablecloth from early 1970s when DIY cross-stitch was a popular craft. Maybe it would fetch $25 but I doubted it would even sell. Seriously: who uses tablecloths these days? So dated! I’m a grandma and I haven’t used either of the two other vintage cloths I own since the 1990s. My generation may cling to their mother’s or grandmother’s tablecloths for sentimental reasons. But hardly anyone is looking to buy a tablecloth that requires hand-laundering and ironing. I’m convinced tablecloths are over and it’s time to think about using these lovely textiles in other ways. Two years ago, I repurposed a couple of vintage French métis (cotton-linen) bed sheets as French monogrammed slipcovers for an easy chair and ottoman. My upholsterer, Deb, did a great job with those. 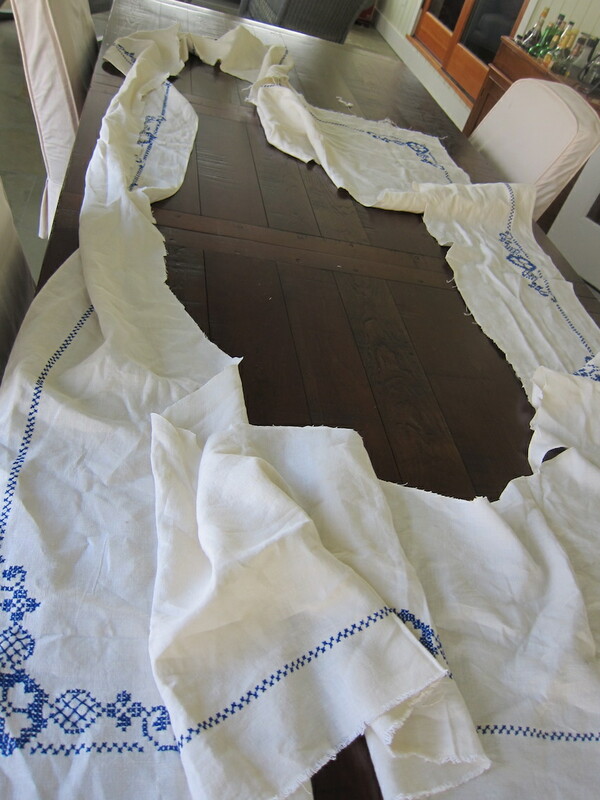 When I walked into her workshop with the ottoman and the tablecloth she greeted my newest project with a big smile. I forgot to take photos of the tablecloth before I took it to Deb. But here’s a shot of the remnant she returned to me. 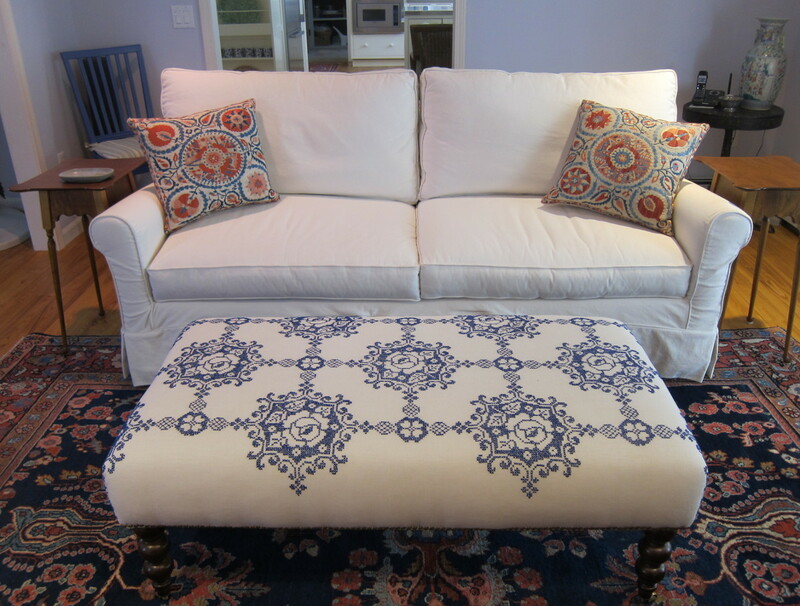 We had discussed using the pretty, more abstract, border for the sides of the ottoman. We also agreed to use the decorative melon-motif brass studs she had in the studio around the base. But I left the final decision on how to use the pattern to her. To me, the ottoman looks like companion piece for the sofa. 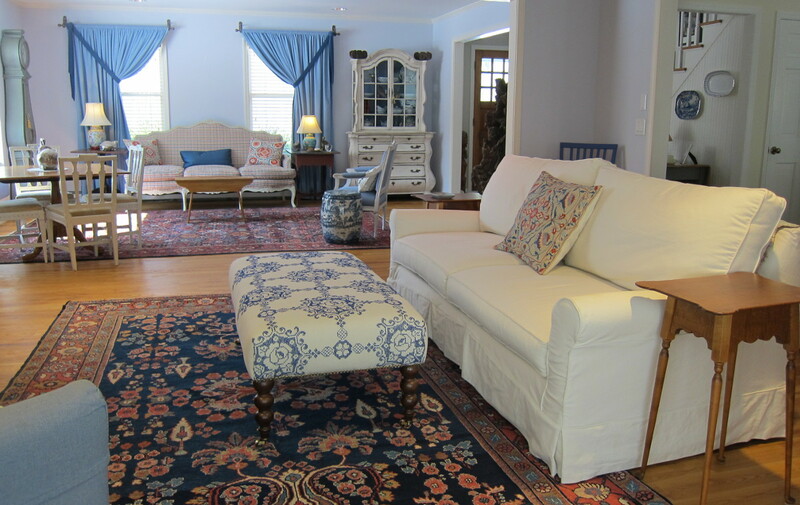 It goes surprisingly well with the suzani pillows and also mixes with my other very trad patterns of the rugs. Now, my attention is turning to the two other vintage tablecloths I have stashed away. One is an amazing white Venetian organza cloth embroidered with grape motifs that I bought in Venice when I was there to study Italian cooking with Marcella Hazan. It’s hanging in the cedar closet and with just the right backing would make a gorgeous scarf for the foot of my bed. 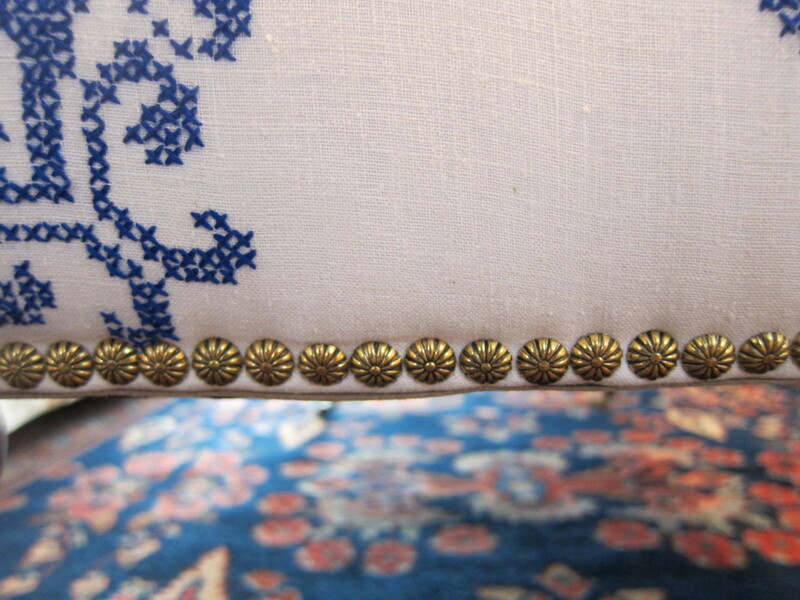 The other is a pale blue damask cloth, with matching napkins, that I bought in the 1990s. I may have used it twice and it’s unlikely it will ever be used again — at least as a tablecloth. It’s ready for a very different life. You also might enjoy Suzani Tsunami.